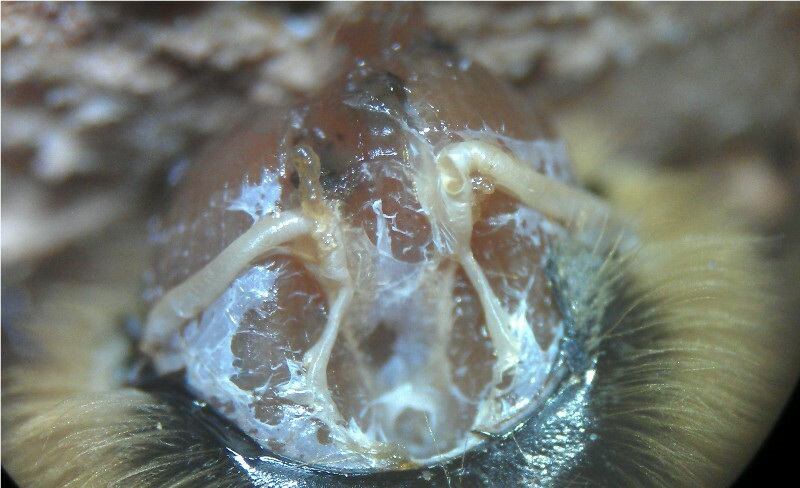 In my opinion there are two reasons to dissect honey bees, the first to diagnose disease and the second, simply to see the inner working parts of a honeybee. With this in mind, I will split this page into these two categories. The photos have been taken by holding my mobile phone up against the eyepiece of the microscope. At the end of this page are a number of recommended books covering the dissection and anatomy of honey bees. There are a variety of 'bee diseases', (including Acarine and Nosema) that can affect the bees to deferring extents. I will look at these individually focusing in on the microscopic identification of the diseases. A brief description of the disease will also be given. If you are a beekeeper, and would like me to examine your bees for Nosema and Acarine please contact me for further information. A sample of at least 30 bees will allow both diseases to be diagnosed. Photos of the samples can also be provided. This is a (now rare in the UK) small mite that is found in the bees tracheae ('wind pipes'), the mite is around 150x65μm in size. 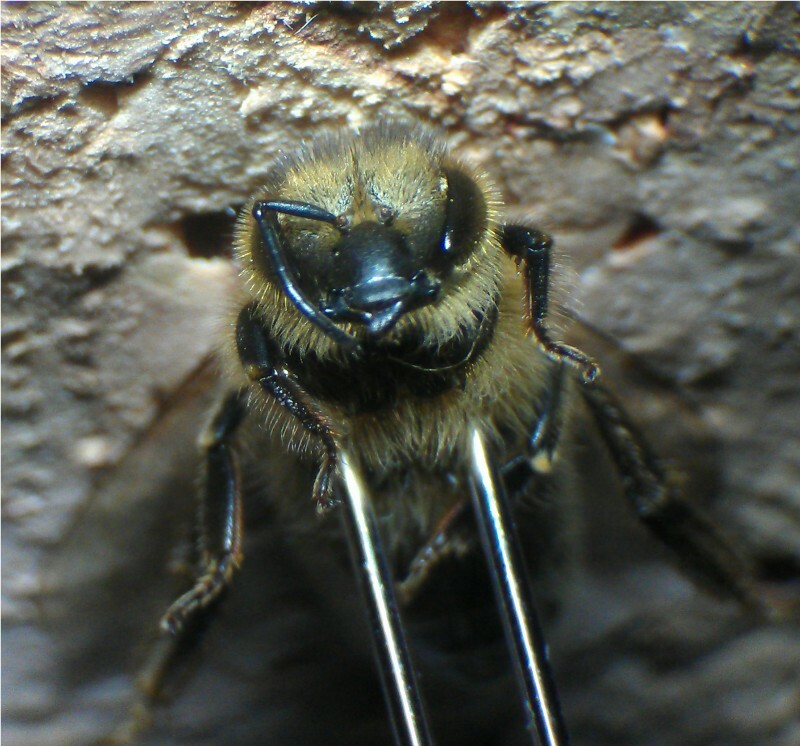 The disease can be found by examining the tracheae, from around 30 bees under the microscope at x30-x40 to see the damage caused, and then at x400 to actually see the mites. 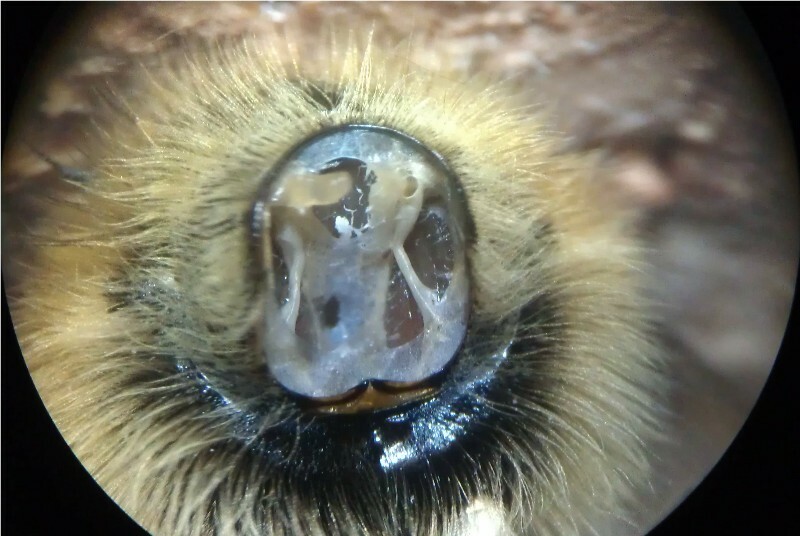 A stereo microscope is used to view the bee whilst the dissection is carried out, the dissection consists of removing the bees head and then removing a 'collar' to reveal the tracheae. Although sounding simple, it does take practice to perfect. The tracheae can then be mounted onto a microscope slide and viewed using a compound microscope view the individual mites. Further information is available on the FERA 'beebase' website. I have included some photos taken showing some of the key steps below. One of 30 honeybee viewed at x10 ready to be mounted for dissection. Mounted onto a cork bung cut at approx. 60° Held in place by the 'acarine needle'. Head of honeybee removed showing the collar with 'joint' located at the bottom of the picture. The collar removed (using a scalpel starting to cut at the 'joint' and then gently pulling away the collar). This step is where the fun begins, a steady hand and care is required. Practice does make nearly perfect in this step. Once the tracheae are exposed, darkening or staining on one or both sides indicates a possible Acarine disease. Confirmation is made by removing the trachea and examining at x400 to see the mites. In case you are wondering, behind the white tracheae, the pink 'salmon like' structure is the large flight muscles attached to the bees wings. 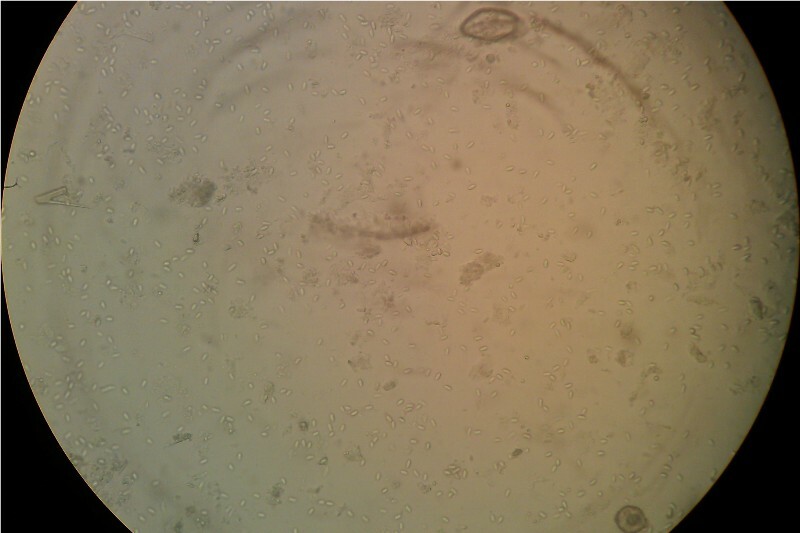 This is a fungi, a spore forming intracellular parasite. In other words something rather small ! The spores reside in the bees gut, millions of spores can reduce the function of the gut, resulting in reduce nutrient absorption and loss of defence against viruses. The spores are approx. 6μm long, resembling 'rice grains' in shape. This disease can cause significant problems to the beekeeper such as reduced life span, poor spring buildup, and increases winter mortality. 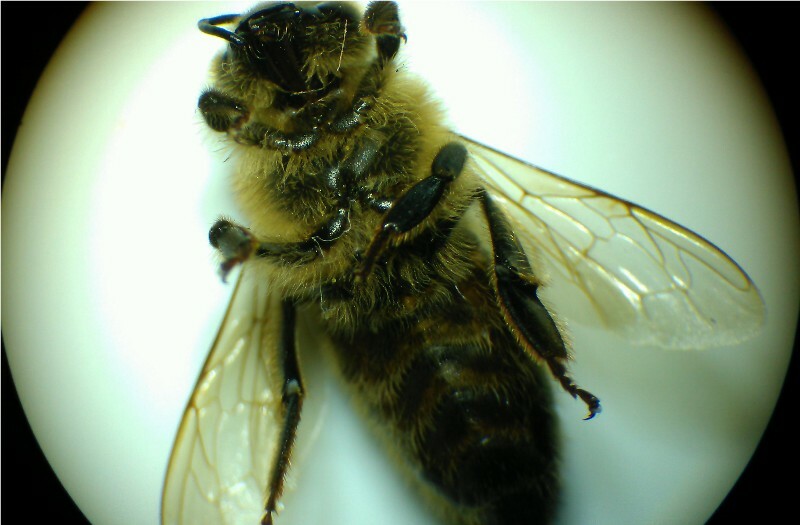 The detection of the disease is by viewing a 'mashed up' sample of 30 bee abdomens with a little water placed onto a microscope slide and viewed at x400. Further information is available on the FERA 'beebase' website. 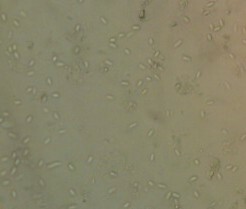 I have include a photo showing what the spores look like viewed at x400. This sample was created using the instructors bees whilst on a KRSC recent microscopy course. If you are interested in dissecting honey bees, two books that I would recommend are given below. Also recommended is the authors website, where details of the book and a free chapter are available. The second book is the 'standard textbook' for the dissection of honeybees, this book not only gives details of the anatomy, but also step by step guides to the dissection of the honeybee. At the end of the book, a number of full page drawings make the step by step guides easier to follow.